Hey all, finally back in HK. This time for the coming years so do expect my monthly HKDL updates to come back starting at the end of this month. I visited the park after a year (thoughts and pics will all go into the July update at the end of this month) and was pleasantly surprised by how much it has improved since. But this post will focus ONLY on Mystic Point (and some other things). The land itself is small. Very and painfully small. Painfully in that it leaves you wanting more - it's size is rather underwhelming for a land that feels of superior quality than any other land in the park save Grizzly Gulch. I don't know for what reason WDI decided to make HKDL an EPCOT of sorts with mini lands (assuming more are on the way) surrounding the "main" park within the berm but it simply doesn't work. Where Adventureland feels massive and empty, Mystic Point is tiny and crowded. An annoying realization when you think how many more quality attractions could have fit within a cleverly organized Adventureland. But oh well, what's done is done. But that doesn't mean shoddy planning should continually affect the park in the future. This entire expansion was poorly planned - however good the attractions are - and it feels poorly planned. Don't even get me started on Toy Story Land and its place among MP, GG and AL. Everything in Mystic Point is superbly detailed. Especially the main building itself. Up close it's breathtaking. Explorer's Club is of equal quality. It feels like a rich environment that is immersive as it is engaging. This sense of awe is immediately then eradicated when you see the ugly green parachutes rising high above the tree line that borders MM from TSL. Just like the park itself, you feel you're in a very tight and small place - it takes away the grandeur of the land. There is however a minor problem. Every building is "too" polished and clean. Almost like the spinners in the Arabia section in TDS. You would assume that the residence of a lone man and his monkey in the middle of the forest would be at least slightly cracked or showing signs of wear and tear. The ride itself is simply good. The level of detail is stunning and the rooms themselves are stunning aided by amazing technology. What stops it from reaching the heights of similar attractions like The Haunted Mansion or TDL's Pooh is that it feels empty. There's not enough in it. There's not enough to look at. Maybe the rumored budget cuts had some part in this but there are definitely not as many artifacts as you all may have seen in the concept art. In truth, MM doesn't hold a candle to the HM. I would want HM instead of what we got in a heartbeat. For a ride that generated so much hype - it does okay. It lacks the depth you feel while you are in the HM. It certainly doesn't underwhelm or overwhelm but it's a welcome addition to a park that needs quality rides. My final verdict would be a solid 7.5/10. That's still a pretty good score for a ride in HKDL. It is one of the best with the best being Grizzly Mountain (a 8.75/10). The ride might grow on me after I go on it a few more times. It is worth repeat visits. Archive Shop Items - 6/10 Most things are NOT exclusive. The land itself - 3/10 You literally need to see it to believe how small it is. I do not exaggerate. The same comment I got from 4 of my family members and 3 of my friends. The Mystic Point Expansion Overall - This grade takes a tremendous beating from the simple fact that the land is just stunningly TOO small. 5.5/10. It's like turning the Tower of Terror (along with its fountain court) at TDS into land of its own. Pathetic and truly sad. I hope we don't get more mini lands but alas it seems this is the path HKDL has chosen for itself. Again it seems we have been shortchanged by HKDL. It is baffling still how small Mystic Point is (there is more to do in Toy Story Land for Pete's sake) and its transition into Toy Story Land. Grizzly Gulch remains the best part of the expansion - delivering an amazing ride with a good overall size and also letting us hope that it may be expanded (unlike Mystic Point which is stuck between two larger lands). Stay tuned for a July update soon! Last edited by HKDLFAN; 07-15-2013, 11:21 AM. Thank you for the update! I can't wait to see your photos! Also keep the updates coming please! ORWEN: It's so nice to see you around again, HKDLFAN, duckling!! Thank you for the trip report. I hope you get to have a lot more fun at HKDL for as long as you're in Hong Kong. Did you see my Rapunzel at the park while you were there? Hugs!!! As admittedly bad as HKDL's planning was, it's not without help. In MM's case, I predict when the real estate becomes more scarce, Toy Story land will be on the chopping block. It's not a bad land in isolation, but they knew it didn't belong I think that's one if the reason it lacks a real attraction. They could have easily copied TSMM but they didnt. But on a serious note, what more do you you really want to add to MM? So it's a tight fit, well look at the park, a lot of things will need to be a tight fit. Hopefully when gate 2 comes along they'll think ahead. As for Adventurland, the fix is so obvious it's kinda funny. The Lion King. Remove the theater and you have a lot of space provided you go all the way to the berm. That and it the train tracks are rerouted around the expansion space and slightly through GG you can make a good adventure land. In a park like HKDL, they should not be removing anything. The park is so scarce on rides the thought should only be expand, expand, expand. Its ludacris that WDI didn't design the park with readily available expansion plots. Yes yes, of course! But I think I was looking at it from an even longer term perspective. FotLK theater, it's little line in front if it, and the waste if some of the backstage space that could be smaller alone take up about a 5th of the track-beamed park. I'm not saying that I'd wish for the show to leave, but that they should have tucked the theater in the corner rather than the middle of the space. I just want them to use the current space more effectively before using up all the big land and wasting it. ORDDU: The Jungle Cruise is another attraction that takes up more space than it's worth. Is it really popular enough to earn its keep? They could have put 3 really big attractions in that same space instead. I think it's popular in HK.....but that might be because there aren't yet that many options. I don't think it should go either, but I wish they rerouted it with more curves and compactness. They basically took the entire Rivers of America and outfitted it with JC. Like, they really were not paying attention when initially designing the park. Truthfully, there's a good deal of room to work with in HKDL. When maxed out I think it can be just a bit bigger than Disneyland, but it's just the poor foresight and placement that makes the park feel a lot smaller. ORDDU: My sisters and I recall the hype surrounding the original announcements made for HKDL before they even broke ground. At the time it was being said that HKDL would be the biggest Magic Kingdom style park ever built up to that point. ORGOCH: Instead we got the smallest Tragic Kingdom style park ever built ta this point!! Somebody must a been doin' crack at the time a them dang announcements!! I followed the expansion project and looked for web map updates and always scratched my head over the park Layout. There seems to be a dead zone between Space Mountain and the Castle. The awkward path doesn't seem to lend to a lot of theming. What's up with the smaller train track design? It definitely seems like I'm watching this thread... Well my guess is that this park was built with parades in mind so they made a designated path to avoid clutter. As for the train tracks... I dont so much mind it. I think from an inside perspective it kinda makes the park feel bigger because (eventually) thee will be stuff on both sides to go to and see . It wouldn't feel trapped. That being said, some reroutes should be in order. Like instead of passing through TL it should go around the back. From what I understood from one of the person that worked on HK, Adventureland does have land that is suppose to be used for future expansion. The interesting thing is that expansion plots within Disney parks are usually landscaped and used as barriers until the right time comes to use the plots of land. Depending on what is placed they also keep in mind the possible redesign of walkways and other show pieces. there goal with these latest expansions were to open up the size of the park without interfering with construction or removal of anything that is already built. Future additions when needed would then bring in walls within the guests areas. so how many acres would you say mystic point is ? and how many acres does mystic manor take? Just had the opportunity to return to HKDL a few days ago and wanted to provide my perspective since it seems to be a little different than this. I avoided most spoilers so I knew generally what to expect but haven't seen a ride-through. I tried my best to temper my expectations and prepare for disappointment, but when all was said and done the ride absolutely blew me away. It is unquestionably better than Pooh (in my opinion - I was at TDL two weeks prior). Pooh is a great attraction but it feels like it is missing a chapter to the ride. While I like the Heffalump room, it is really borderline a bare room with "nothing to look at" once you've gone through the attraction once before. I think the biggest problem people will have with Mystic Manor is the comparisons to Haunted Mansion. IT IS NOT HAUNTED MANSION! Nor is it even remotely close to haunted mansion! The similarities start and end with the fact the attraction contains a place of residence (manor/mansion) in the name. Both could happily be built side by side in all honesty and neither would detract from the other. Heck, Pirates is more similar to HM. Really, if the imagineers had called it Mystic Museum, I think people would drop the HM comparisons. As to the other complaint about it looking too new and shiny. It is NOT HAUNTED MANSION! The entire conceit of the ride is built in the queue that you are welcomed to a very recently built museum to showcase his collection in the turn of the century. It is not a decrepit house abandoned in the jungle or "haunted". It is a new, fully functional, non-abandoned museum showcasing Henry's collection. Nothing evil has befallen the character as in Tower of Terror at TDS. So there is no reason for the house to look haunted or run down, other than the fact people think it is Haunted Mansion, which it isn't. It may be my favourite ride Disney has built, certainly in the tops. But I realize opinions are subjective so each will have their favourites. ORDDU: A witch can understand that point of view, BrianLo, duckling. Thank you for your perspective. I think the reason some of us get hung up on comparing Mystic Manor to the Haunted Mansion is because we had been misled to do that years ago when Imagineers were talking about having a voodoo themed haunted mansion in HKDL's Adventureland. From there the expectations just mushroomed. But you are correct. This new attraction known as Mystic Manor really can't be compared to the Haunted Mansion. Just had the opportunity to return to HKDL a few days ago and wanted to provide my perspective since it seems to be a little different than this. I avoided most spoilers so I knew generally what to expect but haven't seen a ride-through. I tried my best to temper my expectations and prepare for [/I][/COLOR]disappointment, but when all was said and done the ride absolutely blew me away. I liked the ride much better after going in Car 1. Cars 2-4 just don't sell the ride. Car 1 even goes into more rooms! I would go back and revisit my review and change it in ways to better showcase my experience in Car 1 but I'll do that in my Photo Report coming next week. My review here is based on what I saw in Cars 3 and 4 (rode twice). The overall experience in these cars was meh. I was pleasantly surprised by my third ride - did not at ALL expect half the ride to be different with a different car. Literally half the ride is different - either going into different/new/additional rooms or not uselessly lingering on one object. PLEASE READ FOR A BETTER RIDE EXPERIENCE: ALWAYS request to go on Car ONE. Fight if you must. The ride is much better overall. I think I read this somewhere here too a moment ago - each car has a DIFFERENT experience but car 1 has the best one. I can't believe how wrong my review of the ride (not the land) is now. Ha - and there you go, my first ride was in car one (just by happenstance). I enjoyed car 2 still (I think it still does all the rooms? ), but was last to arrive in the Jade monkey room, where a lot of progression happens. Merch I actually found pretty satisfying. They had about 10 different Mystic manor specific shirts, and I kind of like that they had "procured" some merch from WDW parks, specifically Animal Kingdom and Tower of Terror stuff. That said, I was coming off of Tokyo Disney, whose merch is about as awful as their parks are amazing. The problem with the expanding the land is the backstory sets up a very specific reason for its size. You couldn't really add a meaty attraction because the land itself is more or less a lead into the attraction. What would be really cool though is if they added a Henry/Albert second attraction somewhere in Adventureland proper where you join them on an adventure to retrieve one of the objects. 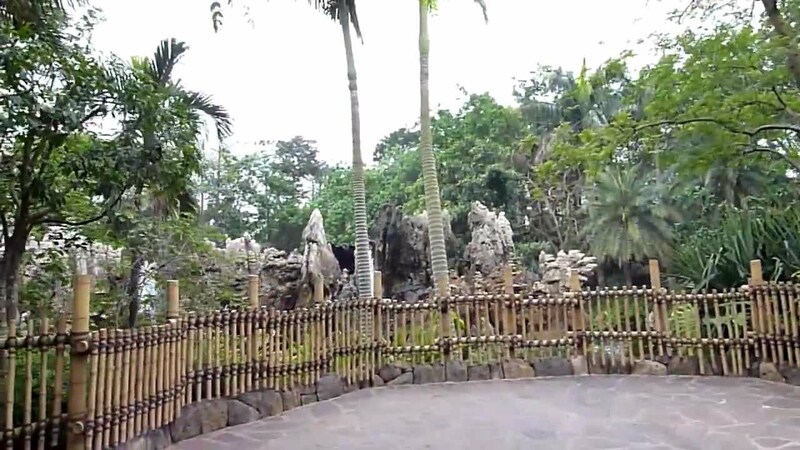 Likewise I hope the ride is never cloned, but if you were to say head out on a journey to retrieve the Jade Monkey statue in Animal Kingdom, that would expand the already really cool S.E.A. mythology, without taking away from HKDL. I do wonder if the other members of S.E.A. are earmarked for attractions somewhere in the future, specifically the pilot and the female captain. Perhaps Shanghai's Soarin'? Last edited by BrianLo; 07-26-2013, 11:57 PM. Let me just add that it would be awesome if the ride could be more like HM! Even more awesome than that would be to add HM to Mystic Point as an additional attraction to plus up the park a little bit more.